Converging Paths is an unusual project. I thought it might be worth taking a moment to explain who and why. In 2005 Slung Low was a young company. 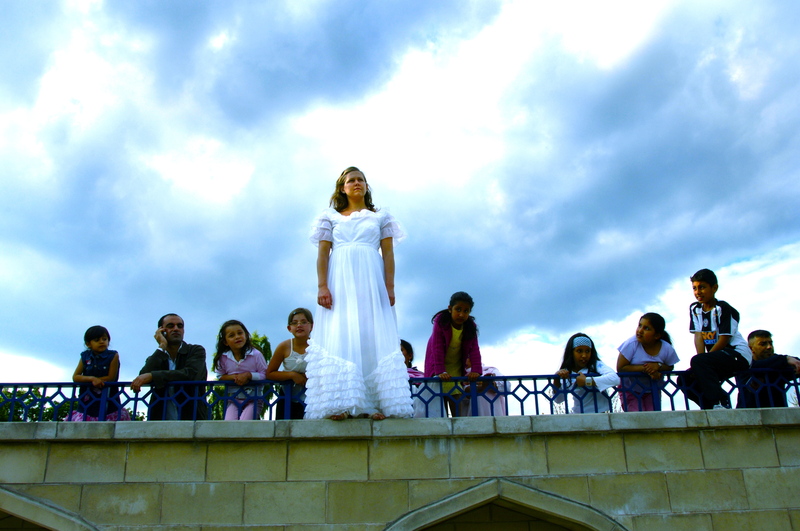 Our first real commission was from Theatre in the Mill and Bradford Festival. It was a piece in the very beautiful Moghul Gardens in Lister Park, Bradford. The first part of the process was for us to put one of our members, Lucy Hind in a wedding dress and take a series of photographs of her in everyday environments, McDonalds, a bus stop… you get the idea. Then those photos were put in an envelope and posted to Slung Low writer, Matthew David Scott with a note – “have a look at these and write us a story”. It’s how we did things back then, we were young and foolish. The short story that he wrote and sent back was adapted into a 4 hour durational piece for the beautiful water gardens in Bradford, a combination of soundscape, story-telling and dance. It was one of those shows that went very well, everyone seemed to like it and we loved performing it. Scotty couldn’t make the show so we sent him the promo video. You can see it HERE in all it’s Boyzone, old school glory. Partly inspired by all of this, Scotty wrote the novel The Ground Remembers which was published by Parthian a couple of years ago. I love the novel – it’s tragic, elusive tale of a young girl from an ordinary world who can tell supernaturally powerful stories is a combination of what all Slung Low shows have been about; stories transforming realities. Converging Paths is a project made up of 5 distinct pieces of performance, each inspired by the novel, The Ground Remembers. 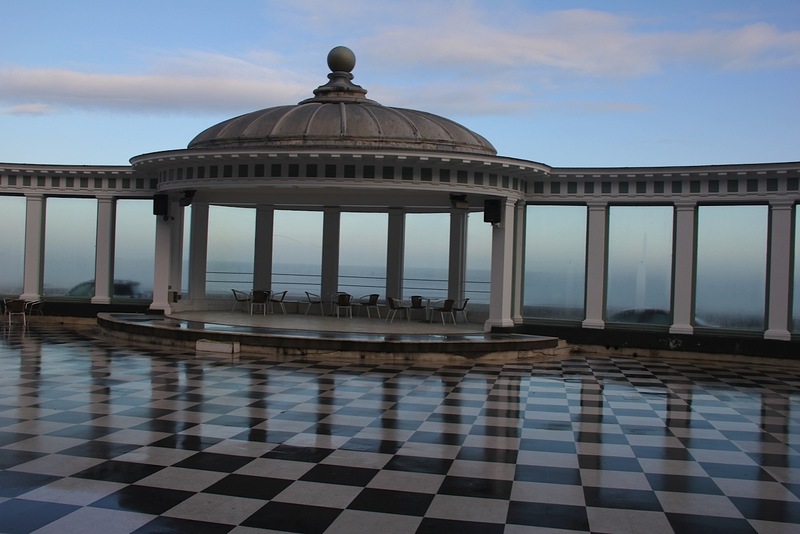 The first of these is Darkness at the Sun Court at the Sun Court at the Spa Complex, Scarborough on 11th February. Each of the 5 performances is a stand alone piece of theatre. Any of the 5 can be enjoyed on their own but taken together, as a body of work, they are an exploration, an extended adaption of the book. Not a straight narrative adaption but instead an extension of the book’s plot, themes and world. Converging Paths was commissioned by a collection of North Yorkshire Festivals; Coastival, Swaledale, Grassington, Harrogate and Ryedale. The opportunities afforded by this was partly this idea of extending the world of the novel, of making a broad theatrical world that isn’t often something we can think about. But also these unusual festivals (primarily not theatre festivals) demand that we engage with the unique sites that each of them are situated on; the Victorian splendour of the Spa Complex, Richmond and Pickering Castles, the spa town harrogate and the rural town of Grassington. And with each of these unique sites, so we will explore different theatre styles, looking at the different ways we’ve approached making performances in the past and applying the right techniques, the most interesting theatre style for each space and each part of the book that we are studying. So it is that the Converging Paths project will see us make the first Slung Low show in which the audience are seated; a show for several hundred and another for only a dozen; a piece on a train and a show that focuses on song. The 5 shows will see us offer 5 distinctly different theatrical experiences for audience, a different adventure each time. Slung Low’s most ambitious project to date has a creative process that runs all the way back to our first ever commission. It’s almost like we planned it! All 5 shows are free. But you must book your ticket. We do hope we’ll see you at one of them.